Although the term “drug—cytokine interaction” has only recently been coined (1),the recognition of an interaction between the acute-phase response and hepatic drug metabolism has been appreciated in the laboratory since at least 1966 (2), and in clinical medicine since the late 1970s (3, 4). The acute-phase response (5) to infection or injury, with its complex cascade of cytokines, endocrine hormones, free oxygen radicals, arachidonic acid metabolites, catecholamines, reactive oxygen species, and nitric oxide, can have multiple effects on the pharmacokinetic and pharmacodynamic properties of many drugs. Disturbances in drug disposition and action can be due to many physiologic changes, including alterations in protein binding, expansion of extracellular fluid volume, end-organ dysfunction (liver and kidney), hemodynamic compromise, hypoxia, and alterations in receptor availability or responsiveness (6). 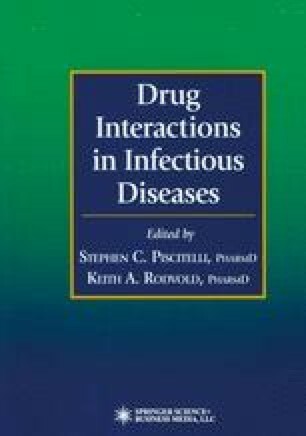 Theoretically, all of these changes could fall under a broad description of “drug—cytokine interactions;” however, this chapter will address the more commonly accepted, narrower focus of potentially important changes in hepatic drug metabolism due to cytokines (7), with an emphasis on the management of patients with infectious diseases.